I have often meditated upon this word: BELIEVE. By definition, it means to be true or real. It can also mean that you have trust or confidence in someone or something. Now let us consider these words: true, real, trust, and confidence. They’re whole concepts that must be proven or come through growth over a period of time. When one reaches a point in time, one accepts the concept. 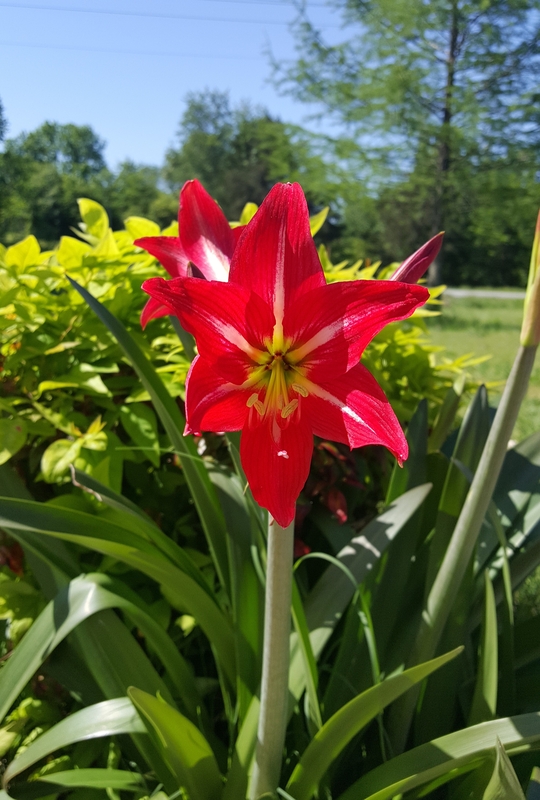 In the photo above this post is a beautiful red flower. Its bulb set in my lily bed for years producing only leaves. I got tired of it taking up space. So I transplanted it by a bush not expecting anything. However, it multiplied and bloomed. Let’s apply that principle to our lives. Sometimes we are not blooming. We need to be moved…to grow…to bloom. Maybe we could change something up a bit. I know a lot of people are upset by change, but I think it is more about confidence and trust, or asking yourself, “Is this a truth about myself?”, “a reality?” Try it. Plant yourself in some good soil. Choose happiness and dwell in the possibilities. About Click this link… links are like roots…Remember even though belief asks you to change your soil…YOU are your roots. Your treasure is where your heart is. Links always lead back to your heart…your soul…your roots.